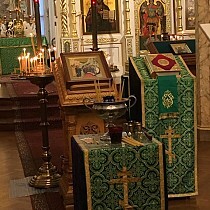 On Tuesday, August 28, the great feast of the Dormition of the Most Holy Theotokos, Metropolitan Hilarion of Eastern America & New York celebrated Divine Liturgy in the Synodal Cathedral of the Sign in New York City. 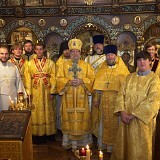 On Sunday, August 19, the great feast of the Transfiguration of our Lord, Metropolitan Hilarion of Eastern America and New York celebrated Divine Liturgy in the Synodal Cathedral of the Sign in New York City. 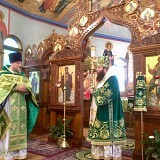 On Sunday, August 12, His Grace, Bishop Jerome, paid an archpastoral visit to Holy Virgin Intercession Church in Glen Cove, NY, where he celebrated Divine Liturgy. 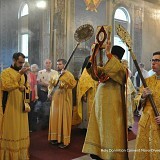 On Sunday, August 12, the 11th Sunday after Pentecost, and the feast of the Holy Apostles of the Seventy, Silas, Silvanus & Crescens, Eastern American Diocesan vicar Bishop Nicholas of Manhattan celebrated Divine Liturgy in the Synodal Cathedral of the Sign in New York City. 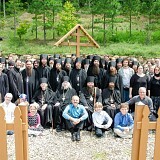 The clergy and parishioners of St. Panteleimon Church in Hartford, CT celebrated their patronal feast day. 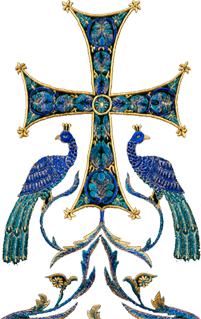 Joining them on Wednesday, August 8, for the All-Night Vigil and Thursday, August 9, for the Divine Liturgy was Metropolitan Hilarion of Eastern America & New York. On Sunday, August 5, the feast of the Pochaev Icon of the Mother of God, Metropolitan Hilarion of Eastern America & New York celebrated Divine Liturgy in the Synodal Cathedral of the Sign in New York City. In every family, there are important joyous dates and feasts. 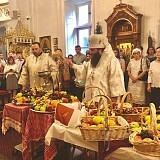 The main holiday of the parish family of St. Seraphim Memorial Church dedicated to the Re-establishment of Unity in the Russian Church is their patronal feast. 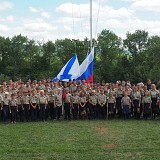 Every year, St. George Pathfinders of America’s New York-based "Tsarskoe Selo" Chapter holds a summer camp for boy and girl scouts of Russian heritage in the Adirondack Mountains of Upstate New York. 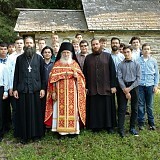 On Wednesday the 11th and Thursday the 12th of July, for the feast of the Holy Supreme Leaders of the Apostles Peter & Paul, His Eminence Hilarion, Metropolitan of Eastern America & New York, paid an archpastoral visit to the Orthodox Youth Camp of the Association of Russian Explorers Outside of Russia in the Catskill Mountains, Woodbourne, NY. 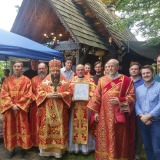 On Saturday, August 4, the feast of Holy Equal-of-the-Apostles Mary Magdalene and in anticipation of the feast of the Holy Great Martyr & Healer Panteleimon, Eastern American Diocesan vicar Bishop Nicholas of Manhattan visited St. Panteleimon Chapel on Lake Kittatinny in New Jersey. 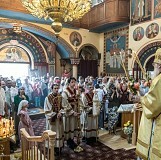 On Sunday, July 29, the annual St. Vladimir’s Day Celebrations at St. Vladimir Memorial Church to the Millennium of the Baptism of Rus’ in Jackson, NJ opened with the celebration of the Divine Liturgy. The three-week "Summer Boys" Youth Program completed its most successful year at Holy Trinity Monastery in Jordanville, NY on July 15.